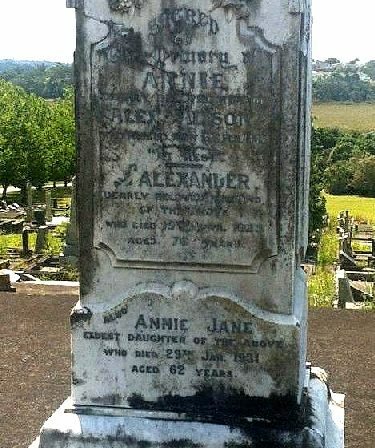 to her 7Oth year, Annie, beloved wife of Alexander Alison. By request, no flowers or mourning. Interment private. HIS LIFE OF SERVICE : Many friends in Auckland will learn with regret that Mr. Alexander Alison manager of the Devonport Steam Ferry Company, died last night at his residence, King Edward Parade, North Shore, in the seventy-seventh year of his age. Mr. Alison had been closely identified with the waterfront all his life and flags were at half mast on the shipping today, as well as on many offices. He was born in Auckland in 1845 and educated at Mr. John Gorrie's School. He practically spent his whole life on the North Shore, being one of the pioneers of that suburb. His kindly disposition and genial smile won Mr. Alison friends on every side and his bright personality will be greatly missed. Of slight build, Alex Alison as he was familiarly called, had a wonderful vitality which more than encounter balanced the handicap of a somewhat frail-looking frame. Until about seven months ago he maintained a full measure of health and strength, and his energetic walk from his home to the ferry each morning must have put younger men to shame. Even when he got aboard the crowded ferry boat he did not deign to occupy a seat, but was content to stand and converse with his acquaintances. Unfortunately a neglected cold made serious inroads into his health and a great change took place in the robust man. He continued at business, however, even when he found the walk to the ferry was too much for him. The last few times he attended at the office he was conveyed by motor car across in the traffic boat, but he had to surrender in the end and his last days were spent quietly at home. When Mr. Alison was 12 years of age he was learning the shipwright's trade, and at 14 he built a comfortable 24ft boat and actually started a ferry across the harbour. Mr. Alison was, at the end of his days, remarkable for the characteristics he displayed when a ferryman at 14 years of age and was therefore well fitted to fill the position of general manager of the Devonport Ferry Company as, while shrewd in business, he was recognised as strictly honourable in all his dealings. Deceased had a boat-building establishment in 1864 and turned out some fast sailers. Afterwards he had a butchering business at Devonport for 20 years. In 1885 he became manager of the Devonport Ferry Company, which position he held up to his death, doing faithful service for 38 years. Mr. Alison was a member of the Auckland Yacht Club and for several seasons was commodore of the North Shore Yacht Club. He also served on the old Devonport Road Board and afterwards was a member of the local Borough Council. For a number of years he was a member of the Auckland Harbour Board and of the Waitemata Licensing Committee. Deceased was a foundation member of the Takapuna Jockey Club and for a long time one of the committee. Mr. Alison is survived by two sons and six daughters. Messrs. A. E. and A. T. Alison and Misses A. and C. Alison. Mesdames F. L. Armitage, A. A. Martin. R. Prime, and J. K. Gardiner. The interment takes place tomorrow afternoon at O'Neill's Point Cemetery. The funeral of the late Mr. Alex Alison of Devonport which took place at O’Neils Point Cemetery on Saturday was one of the largest ever seen in the borough. There was a very large number of old colonists and pioneers present and the manifest signs of grief showed how deeply their departed townsman was mourned. The chief mourners were the two sons of deceased, Messrs. F. A. Alison and E. R. Alison, the Hon E. W. Alison and Mr. D. J. Alison (brothers of the deceased), Messrs. E. W. Alison jr. Ernest Alison, A. Alison, J. Alison and S. Alison (nephews), Messrs. F. L. Armytage, A. A. Martin, and C. Prime (sons-in-law). The Auckland Harbour Hoard was represented by Messrs. J. H. Bradney, Captain Lacy and a number of officials. Messrs. Wallace (chairman) and Harnett represented the Hospital Board, Mr. H. S. King (Mayor) and the Council represented the Borough of Devonport. Mr. .John Alexander, president of the Auckland Law Society was also present, also Mr. Alex. Harris. M.P.. for Waitemata and Messrs. Albert Edward Glover, W. F. Stewart, T. O'Neill, E. M. Coleman, and Mr. R. W. Duder. Prominent amongst the mourners were the officers and employees of the Ferry Company and six of the captains of the company bore the coffin from the hearse to the grave. The casket was simply covered with the wreaths from sorrowing friends. The service at the house was conducted by the Ven. Archdeacon MacMurray and at the grave by the Rev. A. J. Greenwood, vicar of Holy Trinity Church, Devonport.